What is Admin Announcements Group? You are here: Home / Administration / What is Admin Announcements Group? 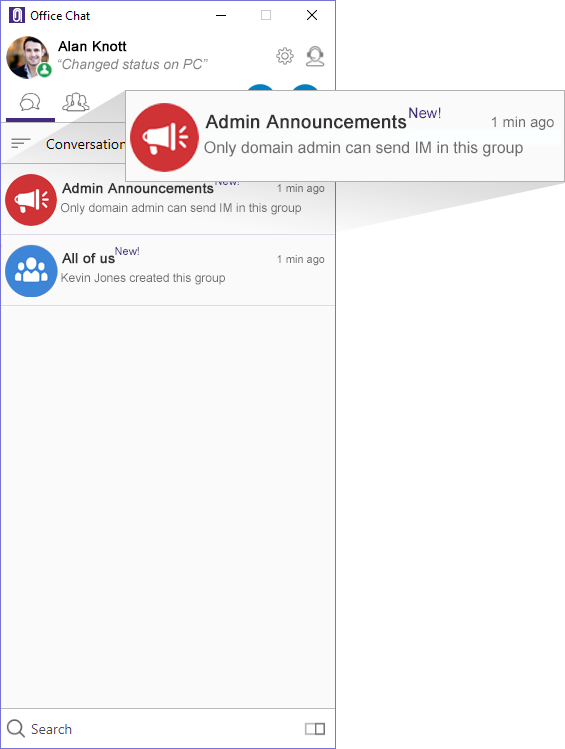 From OC 2.4 release (released Aug 1st, 2017), all your users would start to see a new group called “Admin Announcements”. Your company’s domain admin would be automatically assigned the group creator rights and would have full admin privileges of this group. This group will automatically include all active users in your company and you’ll see a indicator “new!” against the group name. This group is designed to share important announcements and news by the domain admin. This group has no reply back capability so there is no distraction and noise caused with everyone replying back in a group chat. If for some reason you don’t need this group, the domain admin can delete it at any time from the admin portal.